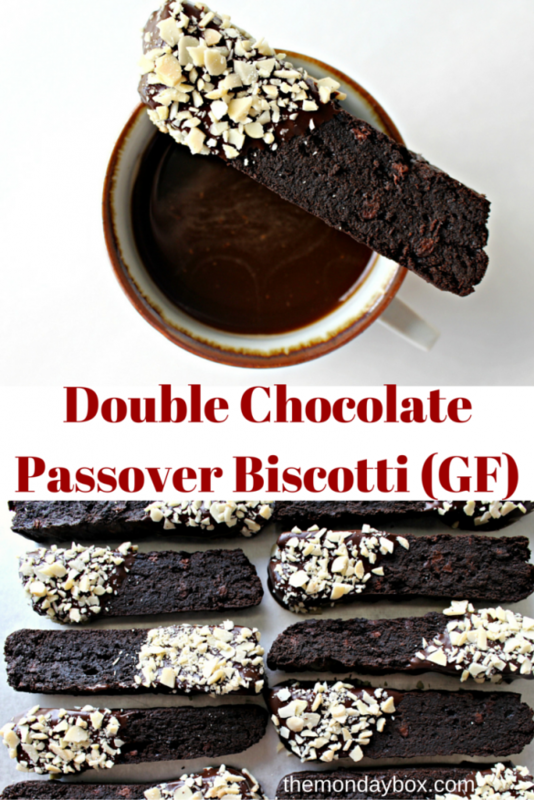 Double Chocolate Passover Biscotti are the third in my series of flourless (GF), Passover friendly goodies all made from the same recipe. 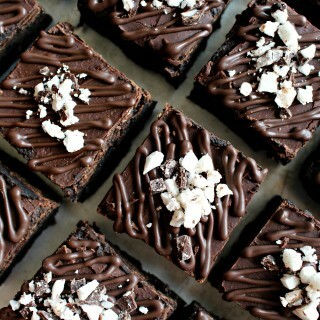 Passover Chocolate Fudge Brownies are baked in a 9″x9″ pan. Flourless Mocha Brownie Bites are baked in a mini muffin pan then coated in chocolate. 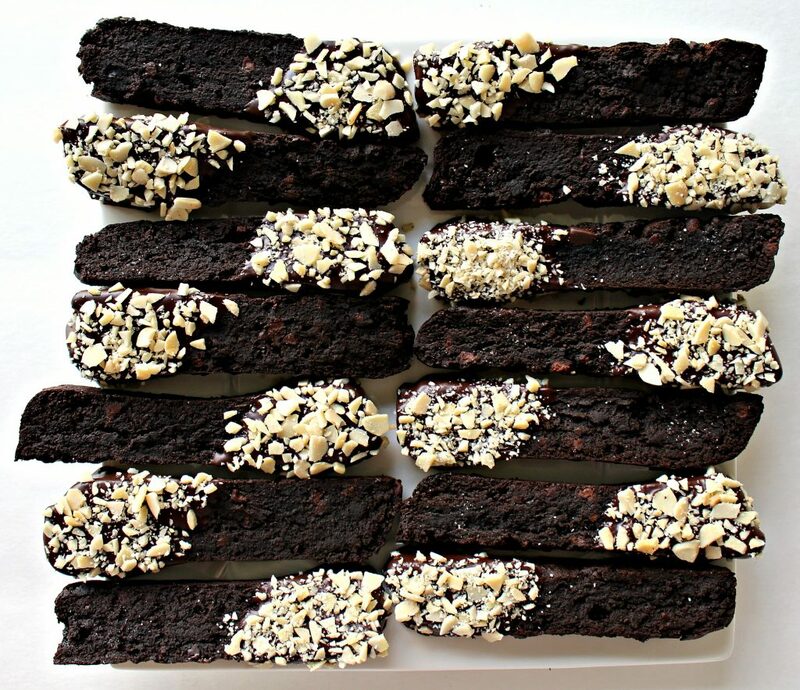 These Double Chocolate Passover Biscotti are baked first in loaf pans, then sliced and baked a second time for a traditional biscotti crunch. 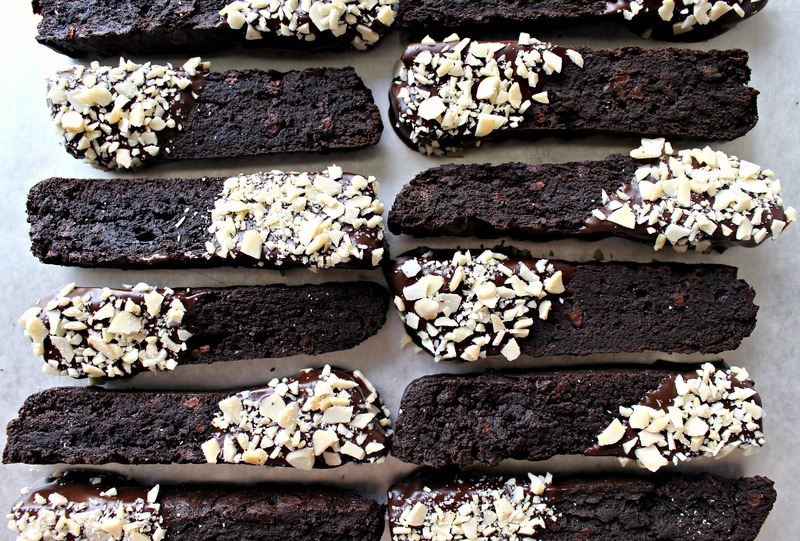 If you or your care package recipient don’t like chocolate, skip these biscotti. 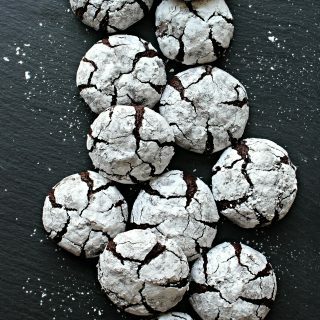 But, if you are looking for a cookie so full of chocolate there isn’t room for flour, you are in the right place! Some people are scared to try making biscotti because they mistakenly think the one extra step of baking twice means making biscotti is complicated. Not true! Re-baking does add to the total time, but the process is easy. This recipe is even easier than most biscotti recipes. Traditionally, biscotti dough is formed into one or more logs before baking. 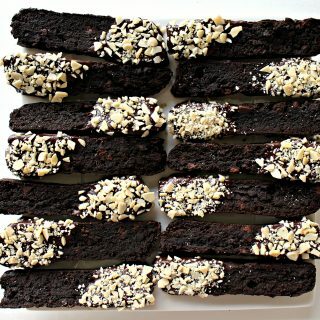 The batter for Double Chocolate Passover Biscotti is just spread into loaf pans like when baking brownie or cake batter. After baking and cooling in the pan for about 25 minutes, the loaf is turned out onto a cutting board and sliced into biscotti. The biscotti are lined up on a baking tray and baked again for about 35 minutes to create the perfect crunch. The Double Chocolate Passover Biscotti are then ready to enjoy. Or, if like me, you have a compulsion about pretty cookies, a little melted chocolate and chopped almonds add the finishing touch. Full disclosure of crispness dilemma: Normally, when a biscotti is baked to crispness, it stays that way. 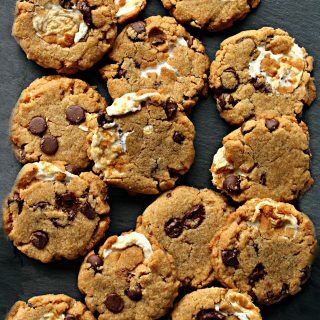 These cookies don’t retain their crispness for more than two days. There are two solutions. If crispness is a priority, then skip the ornamental dip in melted chocolate. The biscotti can be re-crisped in the oven for about 10 minutes. If ultra-chocolaty deliciousness is a priority, go ahead and dip the in melted chocolate. When the biscotti lose their crunch, enjoy them as cookies. Every time I post a biscotti recipe (there are 12 Monday Box biscotti recipes from Fig to Oreo), I like to remind readers that biscotti are the ultimate care package recipe. Biscotti are delicious, sturdy, and stay fresh longer than any other baked good I know of. Biscotti without fruit or jam can stay fresh for months! (Just right for long distance military care packages. )Their long shelf life makes them ideal for keeping handy in the cookie jar at home too. Bake some Double Chocolate Passover Biscotti for those who are gluten free, for Passover, or for the chocoholics in your life. 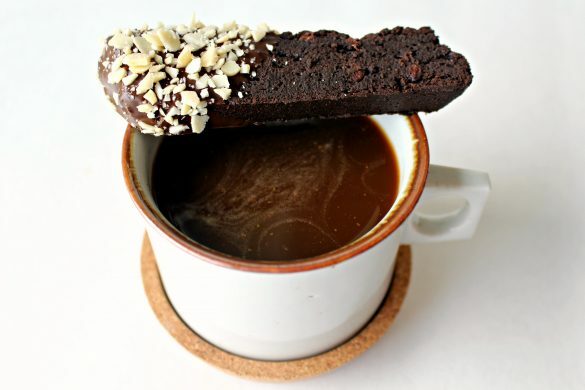 Grab a cup of coffee and a biscotti and dunk. Repeat until blissful. Preheat oven to 350° F. Line 2 loaf pans (6 cup pans = 8 1/2" x 4 1/2" x 2 1/2") with parchment paper. In a large, microwave-safe bowl, melt the butter, chocolate, and nut butter at 50% power for 2 minutes. Stir to combine. If not completely smooth, return to the microwave for 20 second intervals until completely melted. Add the sugar, eggs, cocoa, vanilla, and mini chips and stir until smooth. Spread ½ of the batter into each of the prepared loaf pans, smoothing the top with a knife or spatula. Bake for 25-30 minutes, until a toothpick inserted in the middle comes out dry. A few crumbs are fine. Allow to cool about 25 minutes in the pan. Lift out of the loaf pan onto a cutting board, using the parchment paper overhang as handles. Cut into ½” thick slices (about 16 per loaf). If the biscotti crumble when cutting, allow additional cooling time before cutting. Stand the slices, ½ inch apart, on a parchment lined cookie sheet. Bake at 300° F for 35-45 minutes until the surface of the cookies is dry. FOR TOPPING: In a small microwave safe bowl, melt 2 cups of the melting chocolate at 50% power for 2 minutes. Stir until completely smooth. Line a small baking sheet with wax paper. 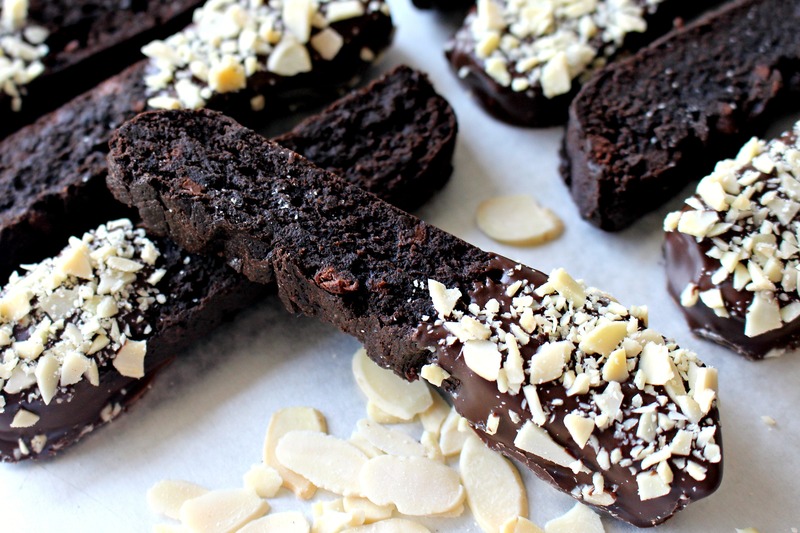 Dip each biscotti into the melted chocolate, place on the prepared baking sheet, and sprinkle with chopped almonds. After dipping 12 biscotti, refrigerated for 10-15 minutes to set the chocolate. Store biscotti at room temperature in an airtight container for up to 7 days. The biscotti lose their crispness after a few days, but are still delicious as cookies. 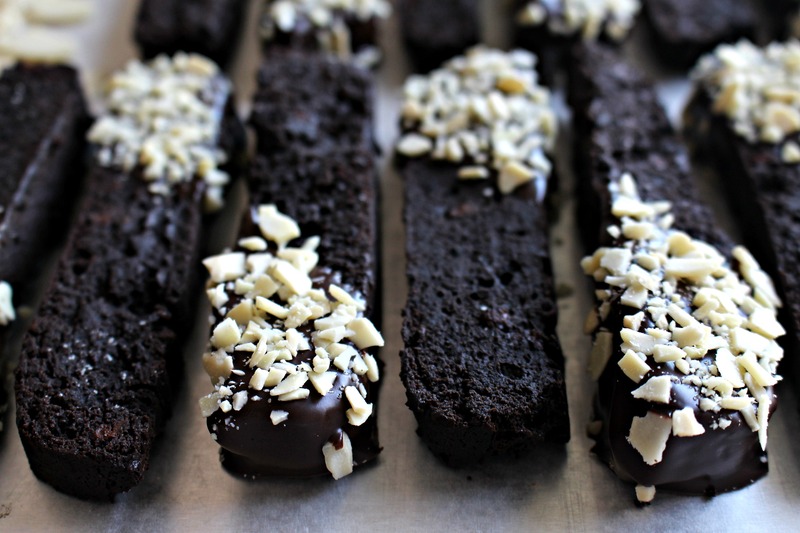 If the biscotti are not dipped in chocolate, they can be re-crisped in the oven for 10 minutes. Wrap pairs of biscotti in plastic wrap, then store in an airtight container or zip lock bag .If shipping in hot weather, do not dip in chocolate. 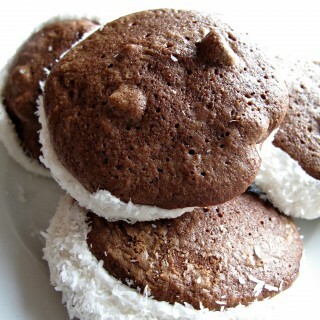 These treats are also gluten free and kosher for Passover! Click on the photo for the recipe. Thanks, Leigh! 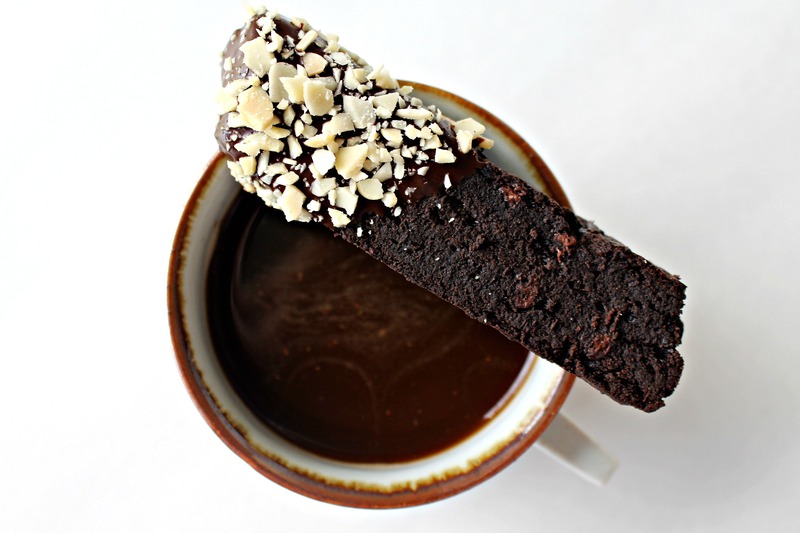 Chocolate plus biscotti is a winner in my book too. Thanks for pinning! Ooo I am so excited that you posted these Wendy!! My mom lovesss biscotti (that whole Italian background) but can’t have gluten these days. I can’t wait to try these out for her! I always think of you, Ashley, when I make biscotti. The thought of you sending biscotti care packages to your grandmother always makes me smile! Now I know that the love of biscotti spans many generations in your family!! I am DELIGHTED that your mom will be able to try these. My gluten-free daughter gave them thumbs up in the crispy first day or two as well as in the slightly softer cookie-like state on days 3-7! Those are the darkest chocolate cookies I’ve ever seen and I love them! I am a fan of biscotti anyway – but these are beautiful. Sharing and pinning! Thanks, Tricia! Making a flourless biscotti left lots of room for chocolate! 🙂 (Hershey’s Special Dark cocoa helps too!) Thank you for sharing and pinning! Wendy those biscotti look amazing. But I’m shocked by the almonds!! Have a happy and healthy passover. 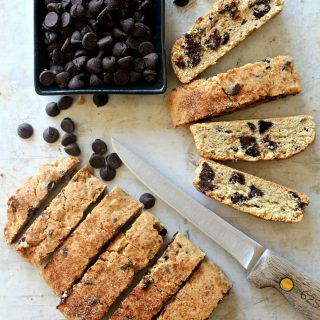 So interesting to see a gluten-free biscotti recipe. I love anything packed with chocolate flavor so you don’t have to sell me on these. : ) I haven’t made a batch of biscotti in a long time and I think I need to very soon, thanks to your inspiration. Hope you’re enjoying Spring so far! Thanks, Monica! Usually, gluten free baking (including biscotti) includes some kind of sub for the flour, often ground nuts (which I can’t eat) or another grain (not Passover friendly). These were a happy experiment. 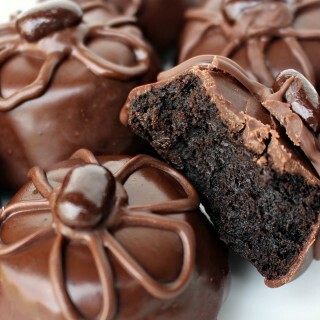 These look super dark and chocolaty Wendy! I love that they’re gf! These are the first ones I’ve seen without any type of flour. I love a softer biscotti so these are perfect for me. 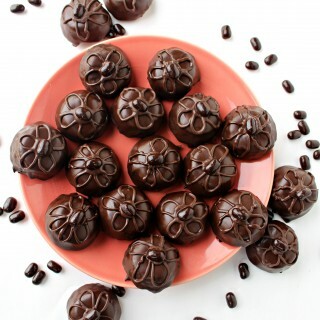 Do these ever look chocolately and delish! Thanks for sharing with us on Throwback Thursday! What a delicious looking treat Wendy. I would never have thought that biscotti could be made without flour! I love all that chocolatey goodness! They look amazing. What size loaf pans? 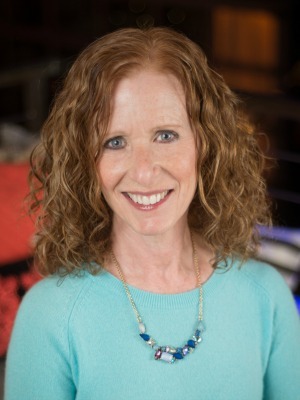 Hi, Becky. Sorry about that. I had no idea there were so many different sizes of loaf pans! I used a 6 cup (8 1/2″ x 4 1/2″ x 2 1/2″) loaf pan, but I think slightly bigger or smaller would work too. I will update the recipe.